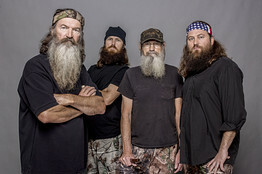 Jase Robertson of Duck Dynasty, after he and his Uncle Si happen upon two dead nutria rats in the middle of the road. In Louisiana, they explain, the state pays $5 for nutria tails because of the damage the rodents do to the marshes. The men pull over, Jase takes out his knife and cuts off their tails.